Franklin & Marshall and the Clinic for Special Children team up on world-class genetic research and innovation. Call it a pivotal moment, a turning point. Archimedes, Galileo, Einstein: Many of history’s great innovators could point to a single instant of clarity when the way forward became clear. For D. Holmes Morton, M.D., that culminating moment came on a rainy August day in 1989 as he pulled his aging Honda onto the shoulder of I-95. He had just learned that his fellowship at Kennedy Krieger, a pediatric research institute that’s part of the Johns Hopkins Health System, was about to end. The Harvard-educated physician had spent a year in Baltimore developing a grant proposal to the National Institutes of Health to study a genetic disorder among children of Old Order Amish. But the grant wasn’t funded. “Basically, I was out of a job,” Morton says. So he made a decision: He and his wife, Caroline, would mortgage their home and move their three children to Lancaster County, where Morton could not only study but also care for his young patients. Eighteen years later the Clinic for Special Children, the nonprofit organization that the Mortons founded in Strasburg, diagnoses and treats more than 100 genetic disorders. In the process, it delivers an invaluable service to the Amish and Mennonite communities. Perhaps even more significantly, it represents what could be the future of medical practice. Now, Franklin & Marshall—along with Lancaster General Health System—is embarking on a five-year partnership with the clinic. 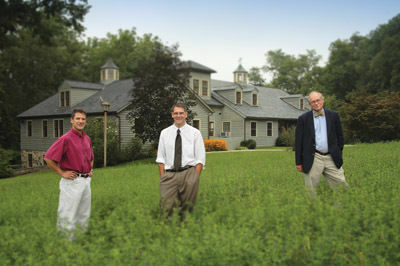 Morton and his colleagues will teach a course and deliver a series of lectures at the College. And F&M students and faculty in a range of disciplines will gain new research opportunities. Almost all Old Order Amish and Mennonites in Lancaster County are descended from a few hundred founding members who emigrated from Western Europe in the 18th century. Because the Plain People seldom marry outside their communities, certain genetic disorders have become concentrated in the population. Morton learned that firsthand in 1987 when he was at The Children’s Hospital of Philadelphia (CHOP). He was asked to analyze the urine sample of an Amish boy who presented symptoms of cerebral palsy. Test results pointed to glutaric aciduria type 1, or GA1, a metabolic disorder that had been reported only eight times worldwide. Morton surmised that, because the Amish were a closed community, he would find more cases of GA1 among them. So he began visiting Lancaster. Before long he had identified 20 children with the disease. He also began uncovering other inherited metabolic disorders among Amish and Mennonite children. Morton wanted to do more than simply study genetic disorders. He wanted to develop screening tests that could identify genetic mutations and treatment plans that could prevent or at least ameliorate disease. Holmes and Caroline opened the Clinic for Special Children in 1989 in office space borrowed from Lancaster General. A profile of the clinic in the Wall Street Journal that autumn drew donations, enough to purchase a few acres of untillable land amid the corn and alfalfa fields of Strasburg. And then in a single day, a team of Amish and Mennonite carpenters raised the post-and-beam structure that has been the clinic’s home ever since. At the time, only 5 percent of GA1 patients avoided a lifetime of serious health problems. But Morton found that a strict low-protein diet could keep glutaric acid from building up in patients’ systems during the first two years of life, when brain development is most crucial. Today, fully 75 percent of newborns identified as having the genetic mutation that leads to GA1 can lead healthy lives. For Erik Puffenberger, Ph.D., the eureka moments come as he works to identify genetic mutations. Puffenberger joined the clinic in 1998 to direct its lab and focus on research, freeing up Morton to spend more time with patients. It’s Puffenberger’s job to run genetic tests that home in on the mutations responsible for diseases treated at the clinic. The lab Puffenberger oversees is considered world-class. The hundreds of thousands of dollars’ worth of equipment looks incongruous against the mortise-and-tenon joints of the clinic’s oak beams. Puffenberger is assisted by several technicians—including, until recently, Mary Morton ’05, the daughter of Holmes and Caroline. Mary is now studying scientific and medical journalism at Johns Hopkins. Puffenberger has spent much of his time of late developing genetic tests for an instrument called a Roche LightCycler. Using a drop of blood, Puffenberger isolates a patient’s DNA and makes copies of it for testing. “We’re developing assays for each of the 100 or so mutations we know about in the population we treat,” he explains. “We hope eventually to have a single test to screen for up to 96 mutations at a time. So parents could bring their child to the clinic, and by the time they leave we’d be able to tell them if they had any of these genetic disorders.” That ability to screen quickly can be life-saving. Many of the diseases the clinic treats manifest themselves shortly after birth and result in brain injury. By identifying affected newborns before they present symptoms, the clinic can often deliver treatment that prevents permanent disability or death. Still, even as he was completing his residency in 2001, Strauss never thought to bring his career to the clinic. But when the Mortons learned he was being courted by labs and fellowship programs, they drove to Boston and offered him a job. Indeed, Morton and Strauss think of themselves as pediatricians first and genetic researchers second. As such, they are proponents of what they call translational medicine—the linking of laboratory research with clinical treatment of patients. Bridging the gap between genetic research and patient care is at the core of the clinic’s mission. Those details will start with a series of “Clinic for Special Children MacArthur Lectures” by Morton, Strauss, and Puffenberger. The three will also reprise their biology seminar and offer guest lectures in molecular genetics, evolution, bioethics, public policy, and other topics. Morton will be adjunct research professor and Strauss and Puffenberger adjunct research associate professors in biology. In addition, the clinic will help the College establish a program in bioinformatics that will integrate disciplines such as genetics, computer science, and biochemistry. The College will create a cell and molecular biology teaching lab in the new Life Sciences and Philosophy Building. Lancaster General Health System will support the partnership and teaching lab through a gift of $500,000. Just as significant is the opportunity for faculty and students to collaborate with the clinic on research. A key area of interest is bioinformatics—the application of information technology to the study of biology. That might involve creating software that can process the large amounts of data involved in genetics research. At the clinic, a single patient’s genotype can generate 50,000 pieces of data. But according to Strauss, there are no software programs that allow physicians to analyze that information effectively. Another area of interest is in sharing equipment and analytical techniques to study diseases. “For many of the diseases we manage at the clinic, our progress in understanding and treating them is to some extent obstructed by limitations in instrumentation or technical expertise,” Strauss says. An example is ganglioside GM3 synthase deficiency, a disease that results in blindness, developmental problems, and death. “We think it’s a treatable disease, but we don’t have the equipment to develop a laboratory method to study it,” Morton says. “But the Chemistry Department at F&M does.” He hopes to work with both faculty and students in studying the disorder and developing treatments. In fact, the opportunities for students to conduct research and other work at the clinic are broad. Students will have opportunities to work with real data from real cases in areas ranging from medical genetics to ethics, sociology, epidemiology, economics, and scientific writing. The clinic has already provided research opportunities to several F&M students, including Mike Fox ’07, who was a biochemistry and molecular biology major. Earlier this year Fox received F&M’s Eyler Award for Advanced Research, which provided a stipend that allowed him to work at the clinic during the summer. Fox’s first exposure to the clinic came through the course taught by Morton, Strauss, and Puffenberger. “I expected that…we would spend a great deal of time learning about some uncommon medical disorders,” he reports. For his internship, Fox shadowed Morton and Strauss as they saw patients at the clinic and at Lancaster General. He also attended a conference with the pediatric liver transplant team of the University of Pittsburgh School of Medicine, where he is now a student. But much of his time was spent with Puffenberger in the lab, where he worked with the LightCycler—equipment funded in part by F&M. Fox helped Puffenberger develop assays that will allow the clinic to run dozens of tests in just a few hours—a process that in the past required more than a day per test. Because many of the diseases the clinic treats can be fatal shortly after birth, the ability to screen quickly can be life-saving. At age 57, Morton wants to do everything he can to ensure the long-term viability of the clinic he and his wife founded. Toward that end, F&M has committed to financial support of the clinic’s research fund and appointed the clinic’s doctors as adjunct faculty. By association with F&M, the clinic will be better positioned to attract additional funding and talent. In fact, the clinic has always strived to deliver medical care as economically as possible, with patients paying only a nominal fee. Nearly one-third of the clinic’s annual budget is raised through auctions of furniture, crafts, and quilts organized by the Amish and Mennonite communities. The events have become celebrations in their own right: visitors consume more than 2,200 pork sandwiches, 4,900 soft pretzels, and 19,000 doughnuts. In fact, the mutations that appear among the Plain People are also found in the regions of Europe from which they originated. Not all the children treated at the clinic are Amish or Mennonite; about 15 percent come from around the world, as far away as Africa and Asia. Likewise, closed communities are sometimes spared certain diseases. Cystic fibrosis, for example, is one of the most common genetic disorders among Caucasians. But it has never been identified among the Lancaster County Amish. That ability to screen quickly can be life-saving. Many of the diseases the clinic treats manifest themselves shortly after birth and result in brain injury. By identifying affected newborns before they present symptoms, the clinic can often deliver treatment that prevents permanent disability or death. Just as significant is the opportunity for faculty and students to collaborate with the clinic on research. A key area of interest is bioinformatics— the application of information technology to the study of biology. That might involve creating software that can process the large amounts of data involved in genetics research. At the clinic, a single patient’s genotype can generate 50,000 pieces of data. But according to Strauss, there are no software programs that allow physicians to analyze that information effectively. They brought Hannah to the clinic as an infant with a severe rash and hair loss. They were particularly concerned because, 14 years earlier, they had lost a daughter to similar complications at only three months. Lab work showed a staph infection and acute anemia, suggesting a problem with Hannah’s immune system. By using DNA samples from Hannah and her seven siblings, the clinic located the disease-causing gene and confirmed a diagnosis of Omenn Syndrome, a fatal disorder treatable only by bone-marrow transplantion. The same genotype data revealed that one of Hannah’s sisters was a perfect match as a bone marrow donor. The testing and diagnosis was performed entirely at the clinic and at very low cost to the family. Transplantation of immune cells from a healthy donor can allow a child with Omenn Syndrome to live in good health. But survival rates are best when the child is very young and the grafted immune cells are as similar as possible to his or her own. At only 62 days old Hannah received the bone-marrow transplant at CHOP. Two weeks later she returned home to her family. Today, at eight months, Hannah has no signs of Omenn Syndrome.